Dental implants are strong, permanent and realistic replacements for missing teeth. Not surprisingly, they are becoming extremely popular with patients. The implants themselves are tiny titanium posts, which are gently inserted into the jawbone. A great deal of skill is required in placing the implants along with careful planning. Over time the jawbone bonds with the titanium, providing what is in effect a false tooth root. A crown or a prosthesis is placed on top of the implant. Implants can replace a single tooth or many teeth and can also be used to secure or stabilise dentures for greater comfort and increases self-confidence. Dental implant retained crowns and dentures are not fixed to other teeth and therefore do not cause any further damage to neighbouring teeth. When teeth are missing the surrounding bone and gum tissue begins to shrink and recede. This can lead to premature aging of a patient’s face and this is a common feature of denture wearers. Implants prevent this bone loss, thus helping retain the natural shape of the jaw and the surrounding facial volume. The end result is a replacement tooth that is so comfortable and realistic you may even forget it’s not one of your natural teeth! With a higher a success rate higher than other dental treatments, implants will allow you to speak, eat, laugh and smile with confidence. You do not have to have a gap in your teeth during treatment – we will be able to provide you with a comfortable, temporary replacement. After your surgery, we will see you regularly to ensure that everything is healing well. After the implant has integrated with your jaw bone, your new crown, bridge or denture can be placed securely. 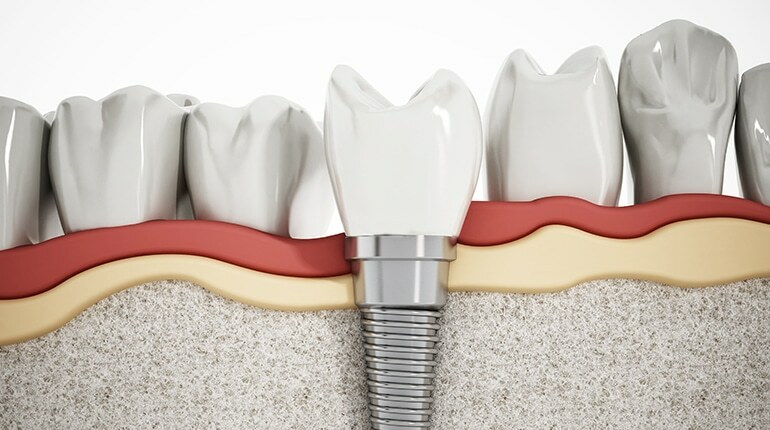 Who will place my dental implant? Dr Belinda Vohra achieved an MSc in Dental Implantology with distinction at Bristol University in 2014 this followed 4 years of study. This qualification is the gold standard in terms of understanding the process of planning , placing and restoring Dental Implants. Straumann implants are used due to their excellent success rates and careful research that backs up their use. Will having dental implants hurt? By using the latest modern anaesthetics we are also able to minimise discomfort during treatment and after. It is easier to anaesthetise for implants as bone tissue has a limited nerve supply compared to teeth. Many patients are amazed at how comfortable the how treatment process is. I am interested in a dental implant – what do I do next? We advise patients to come in for a consultation with Dr Belinda Vohra to assess if you are suitable for dental implants. There are situations when dental implants are not suitable, and alternative treatments such as dentures or bridges are better options. A written quotation on approximate treatment costs and treatment time will be given, as well as payment options including interest free finance. The initial consultation fee is £97* including x-rays. *We currently offer this consultation service free of charge to existing patients.